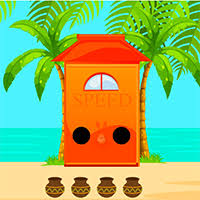 AvmGames - Avm Escape Surf Girl is another point and click escape game developed by Avm Games. Finally! A vacation that you are dreaming for is finally here. You are so lucky that you work in a good company. In fact, they paid for this vacation for the sake of your well deserved rest. They didn't let you down when you saw the beach house waiting for you. You didn't waste time to go inside. This is the best vacation ever. The beach house looks good, but it would be better if you can go out and roam around the beach resort. With that, you wore your beach hat and got ready to go out. However, a problem occurred in the room. The door in this beach house won't open. You don't want to spoil this vacation, so you have to find a way to open the door. Thankfully there are so many items in the room that you can use for your escape plan. Not only that, there are also clues that can help you to solve the puzzles that you need to solve. However, those clues and hints would be useless if you won't use your logic to escape. Good luck and have fun! placed rabbit and 3 eggs.. now stuck..
LOL enter house and ya land another beach..
Good game. A few challenges, but doable. cruising thru game LOL cant use axe or 2 circle thingies..
wont let me axe that 2nd lump of wood.. and Im certain I know where to place circle thingies..
Oh not obvious LOL just axed that box..
TY S3 tip going great guns now..
Hi all. Golden disks just do not fit for me. Tried all the orders, thought that I was wrong and watched the walkthrough, still no success. So red X, I will not restart. Using Chrome under Linux.